Bernhard Langer of Germany hits a tee shot on the 15th hole during the second round of the 2016 Chubb Classic at the TwinEagles Club on February 13, 2016 in Naples, Florida. "Is he human?" Perry asked. PGA Tour Champions rivals have to be wondering about the 58-year-old German star. 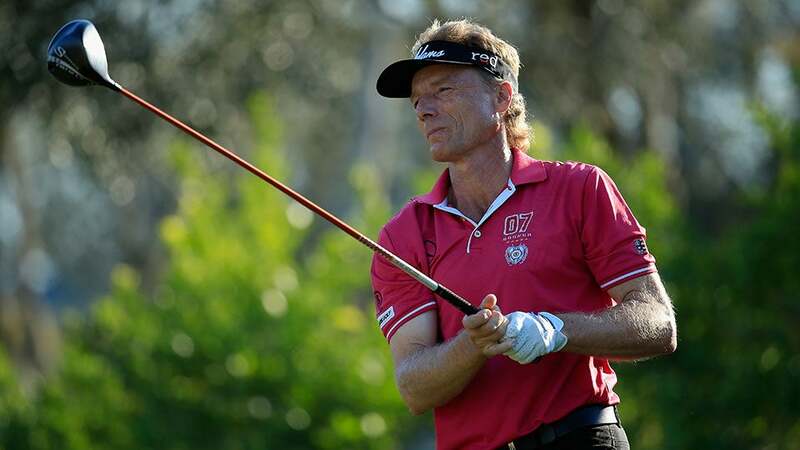 Langer followed his opening 10-under 62 with a 66 on Saturday to increase his lead to seven strokes in the PGA Tour Champions' Chubb Classic at TwinEagles. Langer's lead is the largest in the event after 36 holes. At 16-under 128, he's closing in on the tournament-record 20-under total that he set in 2011 and Perry matched in 2012. Langer won the event in 2011 and 2013. The two-time Masters champion has 25 victories on the 50-and-over tour. "I know when things go great, it's unbelievable the scores that can be produced," Langer said. "I once won a tournament by 17 shots. When everything gets going, you know, I can go low. But there's still a couple of hiccups out there, which I got away with. Like the tee shot on 18 and the tee shot on 17, I wasn't happy with." However, he said his 5-iron shot to 12 feet on No. 17 and bunker shot over water onto the green on No. 18 to save par give him a lot of confidence going into Sunday. Langer made a 15-foot putt on No. 3 for eagle that got his day going. He also had a 25-footer for birdie on No. 16. He also had a few putts he just missed in earlier holes. He's had to change from the anchored-putting stroke he used the past 17 years because a rule change this year. "He looked at me last year at the end of the year and he told, me, 'I'll figure it out,'" Perry said. Langer said players asked him last year when he was going to make the putting change and he said "Not until the season's over." There was a Schwab Cup to be won. And this year, the adjustment is progressing. "I had some fantastic two putts from long distance and made a few and really I didn't miss any short ones," he said. "What else can you expect from a putting, right? Perry and Scott Dunlap were tied for second. Perry had a 67, and Dunlap shot 66. Perry had three birdies and a bogey from Nos. 14-17. Only a bogey on No. 7 stopped Dunlap's birdie run from Nos. 3-8. He also birdied Nos. 16 and 17.